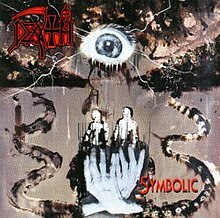 Symbolic is the sixth studio album by American death metal band Death, released on March 21, 1995, by Roadrunner Records. The album was remastered and reissued on April 1, 2008, with five bonus tracks. It is the only album to feature Bobby Koelble and Kelly Conlon on guitar and bass, respectively, and the second and last album to feature drummer Gene Hoglan. Symbolic was released by Roadrunner Records on March 21, 1995. In a contemporary review, Select stated that "there're still lashings of gristly, growling vocals and head-in-the-groin thrashing to be had" as a listener can "snuggle up to witness what dark depths Death's 12-year career has taken them too". Stephen Thomas Erlewine of AllMusic gave the album a three star out of five rating. The review noted that "some of the riffs are beginning to sound a little tired and there is no great leap forward in terms of their musical ideas, but the sheer visceral force of their sound should please their dedicated fans". A review of the 2008 re-issue in Record Collector gave the album a five out of five star rating, stating that the album was as "close to flawless as metal gets, and a testament to the drive and talent of the much-missed Schuldiner". Metal-Rules.com ranked the album as the 7th greatest extreme metal album and the 58th greatest heavy metal album of all time. All tracks written by Chuck Schuldiner. Personnel adapted from the CD liner notes of the original 1995 release and the 2008 reissue. ^ a b c PM (April 1995). "newalbums". Select. p. 93. ^ "Death Metal, Melodic". Metal Storm. August 3, 2005. Retrieved November 15, 2018. ^ "BLABBERMOUTH.NET - DEATH: 'Symbolic' Reissue Track Listing Revealed". Roadrunnerrecords.com. Archived from the original on 7 June 2011. Retrieved 13 October 2011. ^ a b c d Erlewine, Stephen Thomas. "Symbolic". AllMusic. Retrieved April 28, 2017. ^ Bergman, Keith. "Review: Symbolic". Blabbermouth.net. Archived from the original on 13 October 2010. Retrieved 26 February 2010. ^ Thomas Weeber. "Death -Symbolic". Metal.de. Retrieved 17 December 2011. ^ a b McIver, Joel. "Death – Symbolic". Record Collector. Retrieved March 30, 2015. ^ "Top 50 Extreme Metal Albums". Metal Rules. Archived from the original on April 5, 2018. Retrieved December 26, 2018. ^ "The Top 100 Heavy Metal Albums". Metal Rules. Archived from the original on November 30, 2018. Retrieved December 26, 2018. ^ "Amazon.com: Symbolic:Death: MP3 Downloads". Amazon. Retrieved November 14, 2012.